Thanks to dog friendly motels and hotels, you can travel with your dog and take your furry family member on vacation with you! We’ve collected some helpful travel tips for you to ensure the trip and hotel stay with your pet is a delightful one for everybody. While the majority of motels throughout the U.S. are NOT pet friendly, there is a largely untapped market for dog friendly motels. In fact they are an increasingly popular amenity for so many travelers and their pets. How many times have you had to modify your travel plans because you couldn’t find a pet sitter? Because you didn’t want to leave your dog in a kennel? Or you couldn’t afford boarding AND your vacation? Now you have the option of finding dog friendly motels that will accommodate your pet for a relatively small fee. All you have to do is get on the internet and do a small amount of research to find a place to stay. Motels that allow dogs give you the opportunity to take your dog with you on vacation! 1. Call the motel before you arrive to confirm any pet restrictions. 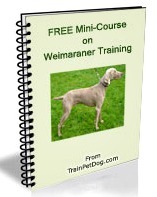 Some will have weight limits, and this can eliminate Weimaraner visits. 2. A dog crate will sometimes be a requirement. Bring one regardless because if you must leave the room it’s a safe place to keep your pet. 3. Make sure your pet’s ID tag has current information including your cell phone #. 4. Be prepared by locating the address and phone # of a local Vet and an emergency Vet. 5. Bring a current photo of your pet so he/she can easily be identified if he/she gets lost. 6. Find out what the local leash laws are. A pet friendly motel should be able to advise you. Don’t leave home without these necessities! Large Dog Crate – This should be large enough to give your Weimaraner dog some stretching room, as there will be times that she will be alone in the motel room. Collapsible Dog Bowl – should be easy to pack and you need to be able to clean the bowl to keep it sanitary. 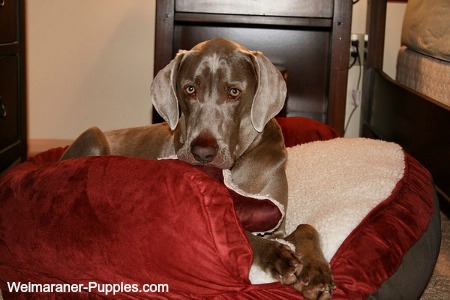 Portable dog travel bed – Your Weimaraner will want to be comfortable when he is away from home, just like you. Dog Poop Bags – Make sure the bags you carry on hike, walks, and romps on the beach, are sturdy and large enough to accommodate your dog’s poop. Pet First Aid Kit – This is especially important if you will be playing outdoors or hunting with your Weimaraner while you are travelling. Stain & Odor Remover – just in case your dog has an accident. If the hotel doesn’t mind you bathing your dog in the tub in your room, don’t forget to bring shampoo and other grooming supplies. You might need them after a day at the local dog beach! At any rate, do a little homework and you’ll be able to include your dog in your fun when you go on vacation this year.